Are you on the hunt for a truck that is light-duty yet can do it all? A wonderful option for an all-around excellent performance truck is the 2017 Dodge Ram 1500. It rides comfortably because of its coil-spring rear suspension, yet can also haul trailers easily with either its beastly V8 gasoline version or the turbo diesel V6. There is loads of cargo space, and you’re sure to find the interior to be attractive too. The engine is perhaps one of this Ram’s best features. It competes in towing capacity with any of the other vehicles in its class. The V6 standard engine is sturdy and reliable and excels in its class for fuel economy. The V8 offers more towing potential. The icing on the cake might be its modern interior technology and smooth ride. The coil-spring rear suspension (class-exclusive) and optional self-leveling air suspension offer the most comfortable drive available. View the 2017 Ram 1500 Inventory! For a full-size pickup that offers a world of options, try the new 2017 Dodge Ram 1500. There are several body styles to choose from. The standard model can accommodate three passengers and has the option of either a 6-foot-4-inch or an 8-foot bed for hauling cargo. For those who need more room in the front, there’s the Quad Cab and the Crew Cab, both of which seat six and have four doors. The Crew Cab has larger rear doors and more legroom for back-seat passengers. While the Quad Cab only comes with the 6-foot-4-inch bed, the Crew has a 5-foot-7-inch option. Available on all body styles are ten trim levels: Sport, Express, Rebel, Limited, Tradesman, HFE, SLT, Laramie Longhorn, Laramie, and Big Horn/Lone Star. The Sport takes performance to the next level with a powerful engine, projector headlights and LED taillights, 20-inch wheels, power-adjustable pedals, and a bonus USB port for charging. There’s an R/T package available for the Sport Trim that includes rear-wheel drive, the 6-foot bed, a limited-slip differential, larger wheels, an upgraded audio system, performance gearing, and a special hood and grille with distinct badging. The Express has automatic headlights, a locking tailgate, carpeted floors and mats, fog lights, 20-inch aluminum wheels, bumpers and grille that match the paint color, a seven-pin wiring harness, tilt steering wheel, cruise control, and a six-speaker system with auxiliary and USB ports. There are an optional Class IV receiver hitch and spray-in bedliner. The Rebel is an off-road version of the 1500. It comes as a crew cab with a 5-foot-7-inch bed. The exterior is similar to the Sport R/T package, but the tires are all-terrain 17-inch, there are front and rear Bilstein shocks, two hooks, black fender flares, keyless entry, and LED fog lights. The interior resembles the Sport as well, but it has some upgraded features such as remote start, cloth-and-vinyl upholstery, heated steering wheel and front seats, rear parking sensors, and passenger seats that seat six. The Laramie, Laramie Longhorn, and Limited are all similar, building on the base package of the Laramie. It is available in extended and crew cabs. The Laramie has chrome exterior trim and a bench seat in the front, 20-inch chrome-accented wheels, wood trim, driver memory settings for the power seats, a ten-speaker surround-sound audio system, heated steering wheel and front seats, and leather upholstery. The Laramie Longhorn, which comes as a crew cab only, further upgrades this trim with a spray-in bedliner, upgraded leather upholstery, leather trim on the rear seats, a navigation system, keyless entry and ignition, tow hooks, a bigger tank, wood interior trim, and accented steering wheel. The Limited includes all these features as well as side-step bars, automatic windshield wipers and high beams, self-leveling air suspension, monotone paint, and the finest leather upholstery available. The Tradesman is similar to the Express, but the receiver hitch and bedliner come standard, and the wheels are 17-inch steel instead of the larger aluminum ones. The bumpers, grille, and door handles are all black and the upholstery is vinyl. The HFE, which stands for high fuel economy, is available as a regular or quad cab with the shorter six-foot bed, rear-wheel drive, and a diesel six-cylinder engine. It has black bumpers and grille, an automatic engine start-stop that doesn’t come with any other trim, 17-inch wheels, heated mirrors, and a tonneau cover. The SLT upgrades the exterior trim to chrome and adds power accessories, an overhead console, 5-inch touchscreen interface with satellite radio and Bluetooth connectivity, remote keyless entry, and two glove boxes. Larger cab options come with a power rear window. The Big Horn or Lone Star includes a power outlet, remote start, power driver seat that adjusts ten ways, including lumbar, dual-zone automatic climate control, a backup camera, a larger 8.4-inch touchscreen, a leather steering wheel, and upgraded cloth upholstery. The base model comes with a V6 3.6-liter engine. The engine puts out a respectable 305 horsepower and 269 ft.-lbs. of torque. The only transmission option is an 8-speed automatic no matter which engine choice you go with. The 2017 Ram also features a new shift lever, now located on the dashboard panel, as opposed to a shifting lever on the floor or column. The base model is a rear-wheel drive model, but there are two models that feature 4-wheel drive. Both of these models have a 2-speed transfer case with low-ranged gearing options. The main difference between the two 4-wheel drive options is that one is standard manual switching and the other offers an automatic mode that will switch you from 4-wheel drive to rear-wheel drive as needed. The 2017 Ram 1500 base model boasts a fuel economy of 20 miles per gallon combined, 17 mpg in the city and 25 mpg on the highway. The 4-wheel drive packages lose a mile per gallon, dropping to 19, 16 and 24 miles per gallon respectively. The base engine on the Laramie, Sport, Limited and Longhorn packages is a V8 with a displacement of 5.7 liters that puts out 395 horsepower and 410 ft.-lbs. of torque. The fuel economy is just about the same as the V6 engine models. The HFE Diesel is an Eco Diesel with a fuel economy rating of 24 miles per gallon combined, 21 miles per gallon in the city and 29 miles per gallon on the highway. 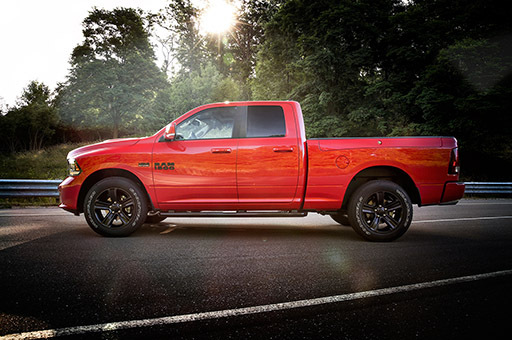 The 2017 Ram 1500, when properly equipped, can manage a tow-weight of 7,610 lbs., with the diesel being able to pull just a bit more; rated at 9,210 lbs. towing capacity. The gas-powered V6 engine can pull slightly more than the V8 for sure, and the same is true for the payload, with the V6 having a max payload of almost 1,900 lbs., the V8 at 1,800 lbs. and the diesel at 1,600 lbs. For 2017, the Ram 1500 looks great, and gives you a lot of options style-wise. Rebel and Limited offer a special grille that is a replacement for the old (Dodge) Ram crosshair. The HFE has side steps that are aerodynamically designed, a shuttered grille that closes if the engine is cool enough, and a tailgate back lip. All are meant to lower wind resistance and make for improved fuel economy. There is a middle ground, with the Sport and Outdoorsman sporting grilles the color of the vehicle body so that there is design flair without overt flashiness. The higher end models also have chrome grilles, LED taillights, and side markers. A few of them have a dual exhaust incorporated in the back bumper. The interior of the Ram 1500 is excellent at any trim grade. Both lower and upper levels are well designed, using fine materials. The Ram 1500 offers optional wood trim and attractive leather upholstery. Road trips are pleasant and enjoyable, as the seats are very comfortable. They have all the right support and soft padding. In the crew cab version, you get the same comfortable seats and lots of legroom in the back. The Ram has two different Uconnect options for your infotainment controls. There is a smaller 5-inch screen, which is sufficient, or you may opt for the 8.4-inch screen. With a larger screen, you get larger touch screen buttons, easy-to-use and user-friendly menu designs, and fast reaction times. If you’re a more traditional driver, most virtual tasks can be easily performed with physical knobs and buttons instead. Numerous modern features for extra convenience are included with the Ram 1500. It is smartphone integrated, which is very important nowadays, with Bluetooth and Wi-Fi hotspot capability. Also, you’ll get voice controls, remote start, keyless entry and ignition, and even power-adjustable pedals. The latter will help you to find a better driving position, as the Ram comes with a tilt-only steering wheel. There is plenty of space inside the cabin and out. With the extended cab, you can flip the 60/40-split rear seats to reveal a convenient fold-out floor space. In the crew cab, the flip-up backseat has shallow bins underneath and the rear floor hides watertight compartments perfect for coolers. Another thing unique to note is the available RamBox storage, which offers two secure compartments inside the bed of the truck over the rear fenders. With the Ram 1500 for 2017, you get terrific safety features. Standard are such things as four-wheel antilock disc brakes, side airbags in the front, and curtain airbags that are full length behind those. There are excellent stability and trailer sway controls, as well as hill start assist. You can also opt for a trailer brake controller that is fully integrated. Other options are a rearview camera and parking sensors for the back. There is an emergency telematics system that comes with models equipped with Uconnect Access and that lets you make a connection with 911 with just one button touch. It also provides tracking of a vehicle that has been stolen. No matter what the cab length, this vehicle got four out of five stars in government crash testing for overall safety. That breaks down to four for the complete front crash protection and five for the side. The best rating of Good was given by the Insurance Institute for Highway Safety in tests for front and side impact with moderate overlap. Good was also given for the design of its seat and head restraints for protection from whiplash when the vehicle is hit from behind.